The limit is hardcoded to 8 threads, or 50% of the cores we have available on this 7410. I’ll post more when I have more details about this. Keep in mind that if you’re running into this limit, that means you’ve already got 8 cores running compression full tilt. This is cool!. At least we knew that read the compressed the data won’t impact performance (or minimal). It’s good to use it in the data where we know it’s more on read (i.e., web page). Thanks for the candid experiment, Dave! Very interesting results! Thanks for sharing it with the world. Here are some observation and a couple of questions. ># The server is a quad-core 7410 with 1 JBOD (configured with mirrored storage) >and 16GB of RAM. No SSD. ># The client machine is a quad-core 7410 with 128GB of DRAM. Interesting selection of server and clients. You have 10 x 7410 w/ 128GB RAM available and choose to use one w/ 16GB of RAM as server. 1. You use 128GB RAM on the 7410 server side? 2. You have readzillas and logzillas on the server side? @Peter: Good questions. The 10 clients were not separate machines, but rather 10 threads on the same machine. Remember, I was trying to observe the effects of compression, not achieve maximum throughput. Using just 16GB of server DRAM allowed me to use a relatively small dataset (30GB) and still show that the server wasn’t just caching writes in memory. By contrast, I chose a client with 128GB of DRAM so the data *would* be cached there to make sure that we were observing the performance of the server and not running into client I/O limits. With 128GB of DRAM on the server, the 30GB data set would fit entirely in cache. ZFS would eventually write this to disk, of course, but it may not happen for some time if the client didn’t explicitly demand it. Performance would be much better, but we wouldn’t observe any effects of compression on workloads where the client speed is limited by server I/O capacity. It might be interesting, though, since it would show just how much throughput the CPU could handle with compression enabled. Neither Readzilla nor Logzilla would really help this workload because it’s just streaming I/O. The flash disks have great latency for small reads and writes, but less bandwidth than a shelf of disks. So it’s faster to write and read 30GB to disk than to send it through Logzilla or Readzilla. So when you have L2ARC, does it cache the compressed data or the uncompressed data? I guess I am trying to figure out at what point the compression occurs and how does it interact wit the hybrid caching mechanism. 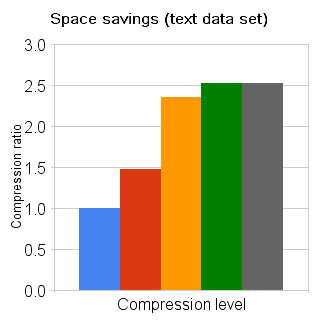 For example, on a write, does it compress it on ARC then it flush the compressed data to disk? or does it continue to cache the data in ARC and do the compression when it gets flushed to disk? Similarly on read, does it decompress the data from disk then place data to ARC/L2ARC as it serve the request or is it caching the compressed data? If the ARC and L2ARC caches the uncompressed data, I would think that having L2ARC could make a big difference, at least in some scenarios. Similarly on ZIL, if the compression occurs when the data is moved from ZIL to disks, I would think it could make a big difference in some scenarios. cache), so the ARC and L2ARC cache the uncompressed data. I believe the ZIL is uncompressed, but that shouldn’t matter (see below). read is much more likely to hit in cache and not have to go to disk. 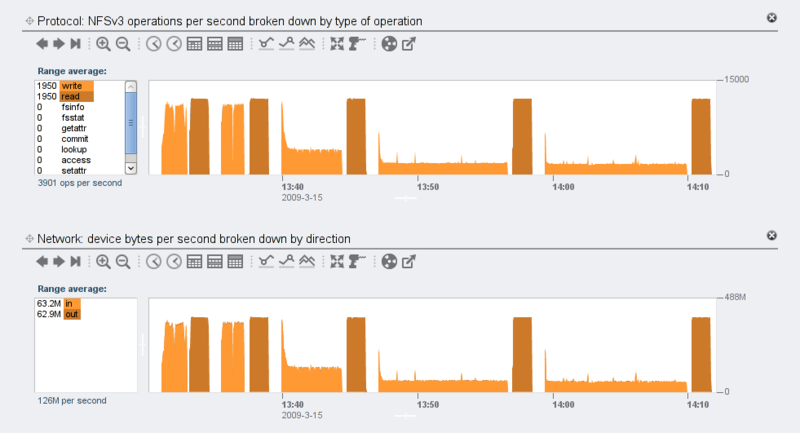 And you’re right that for this kind of workload, the L2ARC could hide the read-side performance penalty of compression. The ZIL is a different story: the ZIL is used to improve the *latency* of small, synchronous writes. You’ll always have many more spindles than log devices, and thus more aggregate bandwidth to the disks than to the ZIL. So if latency isn’t an issue or the writes are large (both are the case in this experiment), the system just skips the ZIL and sends the data to the spindles, since that will yield better performance. 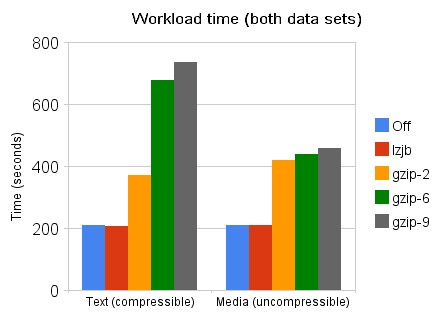 If latency *is* the issue, then Logzilla will help you a lot regardless of compression. Thank you for the explanations. In our env we use NAS to support RDBMS for both OLTP and DSS type workload, so that is where I am coming from. I should be getting our eval unit of 7410 and can’t wait to get my hands on it.